1. Which is the correct symbol for an alpha particle? 2. Of the following, which is the most damaging when ingested? 4. By what type of decay process might 214Pb convert to 214Bi? 6. 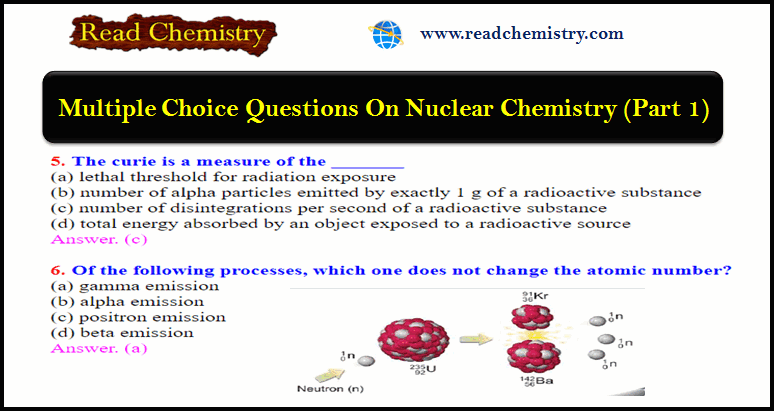 Of the following processes, which one does not change the atomic number? 7. Which of these nuclides is most likely to be radioactive? 11. Which one of the following processes could not result in the conversion of strontium to rubidium? 12. Alpha decay of 226Ra will yield which of the following nuclides? 14. 8Li3 decays to 8Be4. What type of decay is this? 15. _______ rays consist of He nuclei, while _______ rays are electromagnetic radiation. 16. Which type of radioactive decay results in an increase in atomic number? 17. When 249Cf is bombarded with 10B, 257Lr is formed. What other particle(s) is/are produced? 18. Which combination of the number of protons and the number of neutrons is most common among the _______ naturally occurring non-radioactive nuclides? 19. Which form of radioactivity is most penetrating? 22. What particle is released when Ga-75 decays to Ge-75? 24. What would be the immediate product of neutron absorption by 107Ag? 26. The half-life of 32P, which is used as a label on red blood cells to determine blood volume, is 14.3 days. How many days are required for the activity of a sample of 32P to drop to 5.00% of its initial level? 27. The half-life of Sulfur-35 is 88 days. If 8.0 g of Sulfur-35 exists on day one, what fraction will remain after 264 days? 28. When Xenon-123 emits a gamma ray, what is the product? 29. The cloth shroud from around a mummy is found to have a 14C activity of 8.9 disintegrations per minute per gram of carbon as compared with living organisms that undergo15.2 disintegrations per minute per gram of carbon. From the half-life for 14C decay, 5.73 × 103 yr, calculate the age of the shroud. 30. 198Au has a half-life of 2.70 days. Assuming you start with a 10.0 mg sample of 198Au, how much will remain after 10.0 days? 31. The half-life for the beta decay of 233Pa is 27.4 days. How many days must pass to reduce a 5.00 g sample of 233Pa to 0.625 g? 32. The half-life of tritium (Hydrogen-3) is 12.3 yr. If 48.0 mg of tritium is released from a nuclear power plant during the course of an accident, what mass of this nuclide will remain after 49.2 yr? 33. How old is a fossil bone whose 14C content is 15.0 percent that of living bone? 34. Iodine-131 has a half-life of 8 days. How many grams of I-131 in a 4.0 g sample remain after 24 days? 35. The half-life of 45Ca is 165 days. After 1.0 year, what percentage of the original sample of 45Ca remains? 36. What particle is produced when Phosphorus-29 decays to silicon-29? 37. The bombardment of which isotope by a neutron produces 198Au and proton? 24Mg12 + 2H1 → 4He2 + ? 39. What is the product of beta decay of 159Gd64 ? 40. Which of the following is the nuclear equation for bismuth-214 undergoing beta decay?